Again a victory that brings our number of points on 42, which means that Genoa also next year plays in Serie A. A fantastic result 7 matches before the end of the season. With the returned Rubinho, Bovo, Di Vaio and Borriello in the line-up Genoa played a good match that was decided in the second half by goals of Borriello and Rossi. In the 59th minute a shot of Marco Rossi 5 meters outside the penalty-area was blocked by goalkeeper Campagnolo, but towards Marco Borriello which meant his 18th goal of the season. With 18 goals he shares, 7 matches before the end of the season, the clubrecord with Roberto Pruzzo in the year 1976-1977 as most scoring Genoa-player in a Serie A season. The next weeks Super Marco has the possibility to be Genoa’s clubrecord holder and to resist being the first topscorer of Genoa in Serie A ever. It lasted till the 92nd minute to score the second and deciding goal. 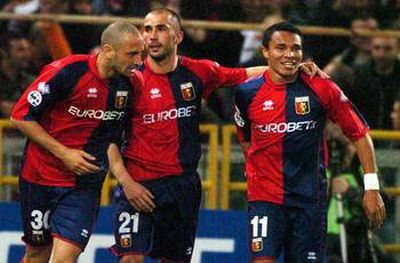 A cross of Fabiano gave Marco Rossi the opportunity to score his first Genoa Serie-A goal in his 100th match in Serie A (18 with Salernitana, 36 with Fiorentina, 19 with Como and today his 27th with Genoa). A great end of a good match which brought our 11th victory this season. Defenders: Bovo, De Rosa, Lucarelli, Santos. Midfielders: Danilo, Fabiano, Juric, Konko, Masiero, Milanetto, Rossi, Vanden Borre. Forwards: Borriello, Di Vaio, Figueroa, Leon, Sculli, Wilson. Luxuriously problems for Mr. Gasperini. Almost all the players are ready to play against Reggina next Sunday, so he has to choose a few players that have to watch the match from the platform. For the first time this season all 6 forwards: Borriello, Figueroa, Leon, Di Vaio, Sculli and Wilson (scored twice this week against Vado) are fit and Mr. Gasperini wants to keep his 3-4-3 system, so he has to choose between Borriello and Figueroa in the line-up. Also Rubinho is ready to defend the goal next Sunday, while Scarpi played a fantastic match against Palermo last week. 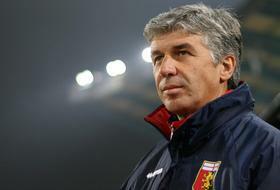 Lots of succes Mr. Gasperini ! Genoa coach Gian Piero Gasperini today told the press that he wants at least 51 points at the end of the season. Halfway the season Genoa had 25 points and our coach wants to see progression in the second half of the season, so at least 26 points. In the first 11 matches of the season Genoa collected 14 points (3 victories against Udinese, Napoli + Cagliari and 5 draws against Catania, Livorno, Sampdoria, Fiorentina and Palermo) just like in the first 11 returnmatches (4 victories against Catania, Udinese, Napoli + Palermo and 2 draws against Livorno and Inter). In the last 8 matches of the first half of the season Genoa earned 11 points (3 victories against Parma, Lazio + Atalanta and 2 draws against Torino and Empoli), so now in the last 8 matches Mr. Gasperini wants at least 12 points on top of the 39 points we have now. Looking at the standings it is the best if we beat in any case Reggina, Empoli and Parma that are all in the relegation-zone and we draw or also win against Torino, Siena and Lazio. 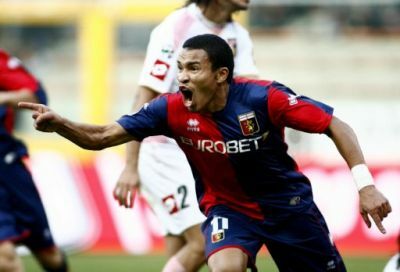 In 1935 Genoa did win for the first and the last time in Palermo, till yesterday. After Amauri scored the first goal from the penaltyspot (incredible decision of referee Tagliavento because Santos played the ball) Genoa scored three times: Figueroa in the first half and Milanetto and Konko after the tea. 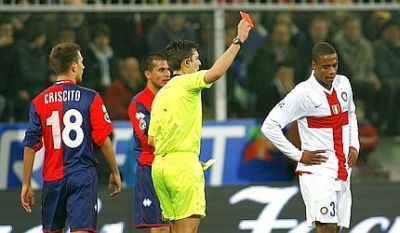 In the last second of the match Amauri scored his second goal, immediately after referee Tagliavento finished the match. A great victory of Genoa that now is on the 8th position in the standings with 39 points, 12 points above the relegation zone, so almost completely save to stay in Serie A. Tomorrow Genoa plays in and against Palermo, with 1415 kilometers the most far way match of the season. Unless the distance and Easter over 100 Genoa-fans follow the team to the capital of Sicily. With Palermo plays ex-Genoano Giovanni Tedesco who played 77 matches and scored 10 goals in our red en blue shirt in the years 2004 till 2006. In January 2006 at the time Genoa played in Serie C-1 Giovanni asked Genoa if he could return to his city of birth: Palermo and Mr. Preziosi gave permission to our very friendly captain who also played many years with Perugia. Thursday-afternoon Mr. Gasperini and his staff went together with 21 players by airplane to Palermo. Comparing to the match against Inter last Wednesday Criscito (3 weeks out because of injury) and Wilson (not ready to play yet) stayed in Genova, substituted by Rubinho and Leon who scored twice in the homematch that ended in 3-3. A fantastic Genoa tonight got only 1 point against Italian Champions and leader in the standings Inter, while we deserved 3 points. Genoa had ball-possession of 67% against 33% and earned 10 corners against Inter only 4. The Gasperini-boys started very agressive with Figueroa and Sculli as forwards and as expected Borriello on the bench. The 27.624 spectators saw that the first counter of Inter in the 11th minute after a mistake of Santos in midfield immediately ended in a goal of Suazo after a cross of Ibrahimovic. Also after the goal it was only Genoa that played football, while Inter only defended which is their specialty. In the 40th minute Inter midfielder Pelè got his second yellow card after he kicked Juric, so Inter had to continue the game with 10 players. In the second half Mr. Gasperini brought Borriello and Fabiano in the field, while defenders Santos and De Rosa had to leave the pitch. Also our 3rd and last defender Domenico Criscito left the field, but unfortunately not because of tactical reasons but with an injury that looked heavy. Genoa did everything to score the equalizer but a goal of Sculli was regulary annulated because of off-side. In the 85th minute we finally succeeded, a shot of Juric was blocked by goalkeeper Julio Cesar of Inter but Borriello volleyed the rebound fantastic in the goal. Genoa now has 36 points and is on the shared 10th position with Napoli and Palermo, the opponent of next Saturday on Sicily.